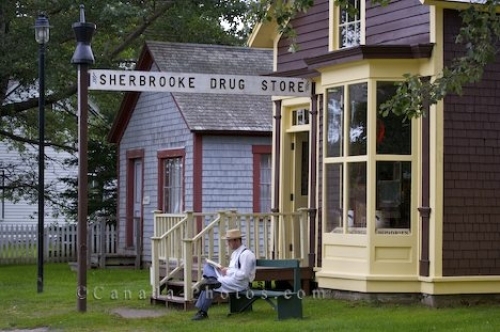 An interpreter who works at the historic Sherbrooke Village Museum in Nova Scotia, Canada relaxes outside the Sherbrooke Drug Store which dates back to the 1880's. The building has only needed a few restorations since then and inside the drug store there are many remedies which helped the townfolk with some of the sicknesses which surfaced in those years. a costumed man sits outside the Sherbrooke Drug Store along the Main Road, Wharf Road, in the Sherbrooke Village Museum (a restored 1860's lumbering and shipbuilding community) in the town of Sherbrooke along the Marine Drive, Highway 7, Nova Scotia, Canada. Picture of a man in costume relaxing outside the drug store in the historic Sherbrooke Village Museum in Nova Scotia.